The University of Wisconsin (UW) System is made up of 13 four-year universities, 13 freshman-sophomore UW Colleges campuses, and the statewide UW-Extension. The most recent UW-System data shows that there were 74,658 women enrolled in full-time undergraduate and graduate programs in Wisconsin and 21,952 women enrolled in part-time undergraduate and graduate programs. Approximately 53 % of students enrolled at a UW-System school are women. Over 124,000, or 69 %, of all students enrolled in the UW System in 2013-2014 received some form of financial aid. The average loan debt for a Wisconsin resident who had loan debt at graduation and received a bachelor's degree in 2013-2014 was $30,452, up from the average of $28,000 in 2011-2012. 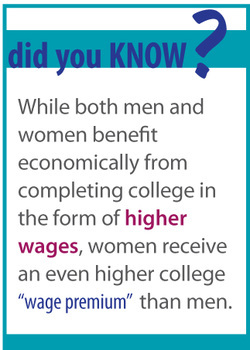 Due to the incr﻿eased costs of higher education and decreased financial aid opportunities, higher education--and the many financial and professional opportunities to which it provides access--has become much less affordable to low- and middle-income Wisconsin women. The Wisconsin Grant Program (formerly called the Wisconsin Higher Education Grant) awards between $250 and $3,000 per academic year in financial aid to undergraduate students in need of financial assistance to attend college. As a percentage of total state support for higher education, Wisconsin’s grant expenditures amounted to only 11%, which is lower than the national average of 13% in 2012-2013. The 2013-2015 budget ended the statutory link between undergraduate tuition (for Wisconsin residents) and Wisconsin Grant funding, meaning increases in tuition no longer trigger increases in financial aid. As a result, program grants will provide even less adequate financial aid to students who need financial assistance to attend university. The 2013-2015 budget also increased Wisconsin Grant funding by $2 million for technical college students. A 2013 audit initiated by the Wisconsin State Legislature found that the UW-System had a budget surplus of $648 million. For this reason, the 2013-2015 budget did not increase funding for the UW System despite a substantial cut in state funding ($315 million) contained in the 2011-2013 budget. Furthermore, a tuition freeze until the 2014-2015 academic year was instituted for the UW System. Governor Walker’s proposed 2015-2017 budget contains drastic funding cuts for the UW-System and would overhaul how the UW-System is governed by converting the system from an entity controlled by the state to a public authority model. The proposed budget would reduce state funding for the UW-System by $300 million over the biennium, which many chancellors at UW-System campuses across the state claim will necessitate staff layoffs. While the conversion of the UW-System to a public authority will provide administrators some budgetary savings from increased flexibility in authorizing construction projects and negotiating employee compensation, the savings from this increased flexibility will not make up for the decrease in state funding. In addition, many faculty and students have also raised governance and other public policy concerns regarding the potential shift to a public authority model. The increased autonomy for the UW-System combined with a lack of funding from the state has also raised concerns that tuition will become less affordable for many potential students. Under the Governor's proposal, tuition for in-state students would remain frozen until 2017, at which time the Board of Regents would have discretion to set tuition rates under the new public authority model. The Joint Committee on Finance (JFC) reduced the Governor’s proposed $300 million cut to the UW-System’s General Purpose Funding (GPR) by $50 million, resulting in a nearly $250 million reduction in state funding. In turn, the Board of Regents will be required to distribute the “saved” $25 million per year to UW-System schools most affected by the cuts. In addition, UW-System President Ray Cross announced a plan to distribute $20 million in existing funding as one-time assistance to campuses in highest need. Although the Governor’s proposed tuition freeze remains in place, the JFC added an exception for the UW-Stevens Point campus allowing the UW-System Board of Regents to increase undergraduate tuition between 2015-2017 if approved by the students via referendum. The Senate increased state GPR funding for the UW-System by $25 million in 2015-2016. This may appear as a positive for the UW-System on the surface, but the Senate also added a provision requiring the UW-System to allocate $25 million of the GPR funding to the state’s general fund on July 1, 2016, which will result in no short-term increase in UW-System state funding. However, the $25 million increase in funding will become a part of the UW-System’s base funding for the next budget cycle, which is helpful for the System’s longer-term budget prospects. The final budget further exacerbates the existing affordability problems faced by current and prospective college students. State support for higher education is inadequate for universities to continue to provide the current levels of service to students at an affordable price. For instance, according to PROFS, an advocacy organization for UW-Madison faculty, state support for UW-Madison has decreased at a rate of ­‐1.3% per year (relative to inflation) since 2000. The primary way for universities to make up for this lack of state support is to increase tuition, which makes college even less affordable to more and more women and girls who wish to pursue higher education. Even if UW-System schools decide to eventually raise tuition to offset the decrease in state support, tuition increases will not be an option until 2017. As a result, the UW-System will face an immediate budget shortfall and will be forced to absorb the proposed cuts in the form of staff layoffs, reductions in services and other budget cuts that undermine their educational mission.